Click on the title to see the complete story. Winner of the Alfred Fried Photography Award's world's best picture on the theme of peace, worth € 5000, is Emil Gataullin, Russia, with an image from his work "Towards the Horizon"
The winning picture will be on display for one year at the Austrian Parliament. Once in America a war was waged against an animal. It was a gigantic slaughter. The aim was to transform bison into money. As a positive side effect the livelihood of the Prairie Indians was destroyed. They should make room for the white settlers, farmers and ranchers, cows and cowboys. Never before in history had humans killed so many animals within such a short space of time. Millions. In 1902 only twenty-three wild bison in the United States were left. 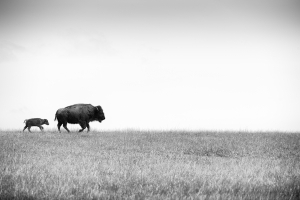 The bison played a key role in the complex ecological system of the prairie. Its disappearance was fatal. The prairie vanished in the wake of the bison’s extinction. The cattle of the ranchers stripped the soil bare, the farmers ploughed the grass to gain farmland. Serious erosion of the soil began. In the 1930s, parts of the Great Plains turned to dust, which was carried by storms all the way to New York. It was the time of the Dust Bowl, also known as the Dirty Thirties. Crops were destroyed, droughts caused people to move away. Tens of thousands of settlers left the land which had been rendered worthless. Today the bison returns. The hope: If hundreds of thousands of bison were free to roam the Plains again, the land would also recover, in ecological, economic, and social terms. The bison is a symbol for us: There must be places out there where such archaic creatures may live freely. This is vital. Only a world in which this is possible is a world worth living in. This is what the bison stands for. Our photographs should be understood in this sense. The images were made in the heart of the bison country, in North Dakota, South Dakota, Wyoming, Colorado and Montana. 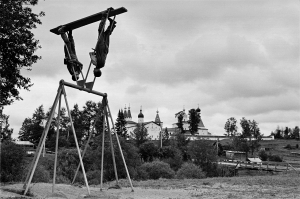 This series developed as I visited small suburban towns and villages of Russia. It shows the lives of people, their relationships with each other and the places they live. I take photographs of province places during the several years now. This is my main topic, I would say. I live close to Moscow, but don’t really take pictures there and take every single opportunity to go somewhere far from it, to some small town or village. This is where I try to find some points of interest for my photographs. There is some charm, peculiar to the province life that big cities do not have. When you leave Moscow for province you feel like crossing the border between two different worlds, the feeling of space changes so the feeling of time does. In the capital the space is closed, limited by the buildings walls, time is concentrated, it is always not enough. The space of province appears to be endless, it spreads towards the horizon, and the time runs slow, almost by itself. In province you feel you want to walk. The more space, the more your feet can cross. The slower time flows the less you hurry. The regular life goes slow. One can find it gray and boring; other can find there something the capital does not have: the feeling of the ground and nature, the escape from city bustle. Different space means different people. Yes, they can be not as smart as those who live in the cities, the demand much less, but at the same time they are much more real and open-minded, their honesty is what you want to believe in. This serie is first of all a personal need of expression, towards the recent events evolving in the middle-east, in this project regarding the protests and the ongoing civil war in Syria. 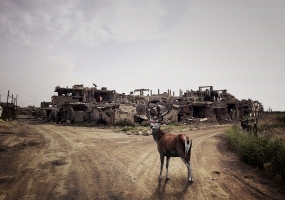 In every image a wild animal is put into a warzone, in the places affected by bombardments and by prolonged fighting. The presence of the animal wants here to represent the healing of these places. The wild animal, in this environment, without the conscience of what has really happened there, represents the quietness, the end of the violence. No animal can stand quiet in a place, while feeling the presence of imminent and actual danger for its life. Bringing them into these warzones, represents the possibility of this war to end, and that peace can be there again. The peace here is the nature, the wildlife coming back into a place where human beings and life were chased away. The suffering that fades away. To forget, meaning not the oblivion of what happened, but the chance to interiorise and overcome the pain. To reach for a peaceful soul and then to be at peace with others. Bayernkaserne, Munich’s first accomondation facilities for asylum-seeking refugees is the biggest of it's kind all over Bavaria and maybe even Germany. More than 2000 refugees of different nations, religions and cultures are living here and waiting for further perspectives. The number of arriving people increases every day and authorities are often facing massive problems to care for them? Since more than four years I'm working in team for the Munich-based NGO 'Refugio Kunstwerkstatt', offering weekly photo workshops for young refugees. Medial and public reflection also increased, often focussing on matters of integration, social aspects and how to help and support immigrants. But what do those people really feel, the first days after they arrive from their long and dangerous journey? We've tried to let them tell their own story. What's your message to the universe? For the portrait project STATUS we've asked refugees to find a place at Bayernkaserne, they either just like or find representative for the place and situation there and also to implement some additional space for comments, letters, or messages they will be able to add after the picture is taken. The idea is to create a dialogue between a photographical interpretation of their staging and their ideas, handwritten and transferred to those pictures. Also pictures of the actual current place Bayernkaserne are hard to find without using stereotypes or catchy, expectable motives. Here, the place description is influenced by the locations, the portrayed person chose. 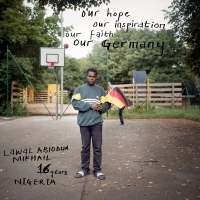 This pictures and also the messages are not representative for the situation of refugees in Germany or Europe, most of them are expression of a first respiring after experiences of war, insecurity and escape, maybe a first idea what peace could look like. It is their scars which draw attention to them. They are openly stared at or eyed discretely. Some people look away immediately because they feel uncomfortable or want to forget what they have just seen. It is easier for society not to acknowledge those who are different, to ignore them and thus to make them invisible. Therefore, it is not only the visible scars from which survivors of fire and acid attacks and accidents are suffering for their whole life. Above all, it is other people’s reactions to their disfigurements which are pushing them to the edge of society. For my long-term project IN/VISIBLE I traveled to India, Pakistan, Bangladesh, Uganda, Nepal and Cambodia over the last year to portray and interview 48 female survivors of acid and fire attacks. The women I visited are just a few of the many that are attacked with acid or fire to purposely disfigure or kill them. Officially there are around 1500 acid attacks reported worldwide every year. The majority of which are women. The number of unreported cases is estimated to be much higher. With the portrait series I wanted to give them the opportunity to present themselves as individuals beyond the collective stigma of being branded; I wanted to give them a face again, to make them visible. The neutral black backdrop was supposed to abstract from the social environment and to give them an atmosphere of security and a special – if celebratory – framework. A framework, in which they felt able to present themselves and pose as they felt right rather than to be presented as a tragic victim, but rather show their inner strength and peace they have gained after all their struggle and pain they've gone through. Militärisches Übungsgelände, Internationaler Flughafen und jetzt Erholungsgebiet. Die Geschichte des Tempelhofer Feldes ist fest verankert in die Zeitgeschichte Deutschlands: Weimarer Republik, Nationalsozialismus, Bundesrepublik und vereintes Deutschland. Und wie sie ist ihr Weg der Weg des Friedens. Der Kern des Areals hat den politischen und gesellschaftlichen Turbulenzen des letzten Jahrhunderts getrotzt: die Brache. Einst am Rand der Stadt rückte sie mit der raschen Entwicklung der Metropole immer näher ans Zentrum heran, so dass, als der Flughafen die Fläche nutzte, er "Zentralflughafen" benannt wurde. 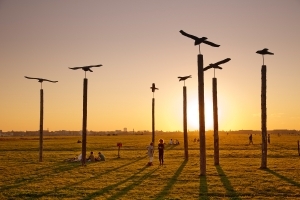 Mit der Schließung 2008 des Flughafens Tempelhof bekam die Hauptstadt seinen größten Park: Größer als der Central Park in New York oder Hamstead Head in London ist das Tempelhofer Feld eine weltweit einmalige Freizeitfläche innerhalb einer Millionenstadt geworden. Sie lässt jeden, der von einem der fünf Eingänge auf das Feld kommt, erstaunen: die Leere. Sie ist hier die Hauptattraktion, der Magnet, der massenweise Besucher anzieht, weil sie ein einmaliges Freiheitsgefühl vermittelt. Das ist in einer Großstadt wahrer Luxus. Ein Luxus, der aber umsonst zu haben ist. Freiheit ist eine Grundbedingung für Frieden und hier auf dem Feld erlebt man dies Tag für Tag. Keine Schlägereien, kein Diebstahl, keine Drogendealer wie an der angrenzenden Hasenheide. Die wenigen Parkwächter, die unterwegs sind, sorgen in erster Linie dafür, dass nicht außerhalb der zugewiesenen Zonen gegrillt wird. Das friedliche multikulturelle Miteinander wird auf dem Tempelhofer Feld hauptsächlich durch Eines befördert: die Weite.